is one of the leading international instrumentation engineering enterprises specialized on monitoring, measuring and regulating the physical quantities of flow through, pressure, level and temperature. 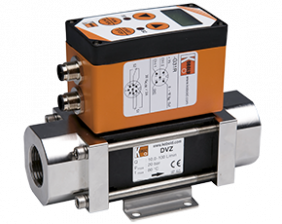 The compact KOBOLD Vortex flow meter Model DVZ is used for measuring and monitoring smaller and medium-sized flow of low viscosity, water-like liquids in pipes. The device works using the vortex principle, making it virtually maintenancefree. This involves the installation of a sharp-edged object (the vortex generator) in the flow duct. Vortices are created behind the object whose frequency is proportional to the velocity of flow of the liquid. The flow volume can be determined with a very great degree of accuracy by measuring the vortex frequency. This achieves very high linearity over the whole measuring range. The device can be fitted with switching, frequency or analogue outputs. There is also an optional compact electronics package that includes a digital display, and both a switching and analogue output. Dosing and metering electronics are currently being developed.